This is not a picture of anything I saw, it was sent to me by my brother Ken, who got it from Joe at work. If you click on it, it's easier to see the big fish chomping on the little one. I think it's Joe's fish(es?) but I haven't been able to get the details because Ken's on vacation in Glacier National Park right now with his family. I'm dying to find out whether Joe got the bigger northern into the boat, and how big it really was. I'm gonna go out on a limb and assume that he was NOT able to release the smaller northern! The closest I ever came to this kind of action is one year when I was ice fishing on Medicine Lake and I was looking for panfish in the morning. I caught a dinky little sunny on what I think was probably 4# or maybe 6# test, I don't remember for sure. But I do remember that he was suddenly putting up a much better fight. When I got him up to the surface, I was able to see the northern that had latched onto him on the way up. It was only about 2 pounds though. It was fun because I wasn't expecting that kind of fight from a sunfish. But yes, I did get them both through the ice. That northern just would not let go. It's been about a year since I've even been fishing now (I should be ashamed!) I used to almost live on the lakes around here when I was out of work. The last 10 years I've gotten busy: You know, work. It just doesn't leave a guy enough time to fish. Unless you don't like to sleep. Saturday has turned into a battle between sleeping in and waking up early enough to get the fish. Sleep has been winning way too often. I absolutely LOVE the thrill when you see the flag on your tipup standing tall. I think it's even more of a rush than summer fishing, because when a fish hits your lure in the summertime you get a pretty good idea right away as to how big it is. But when you're lookin' at that flag it could be anything from a false alarm (sucker minnow too big or too active or, hopefully, too scared of the big fish that is lurking in the area) to a state record. Depending on the lake, it could even be a muskie! We used to catch muskies through the ice on Bush Lake years ago shortly after the DNR had stocked it. They were all over, though small. As they grew, I suppose some were eaten and the rest spread out and claimed their territory. Now they're real hard to find. 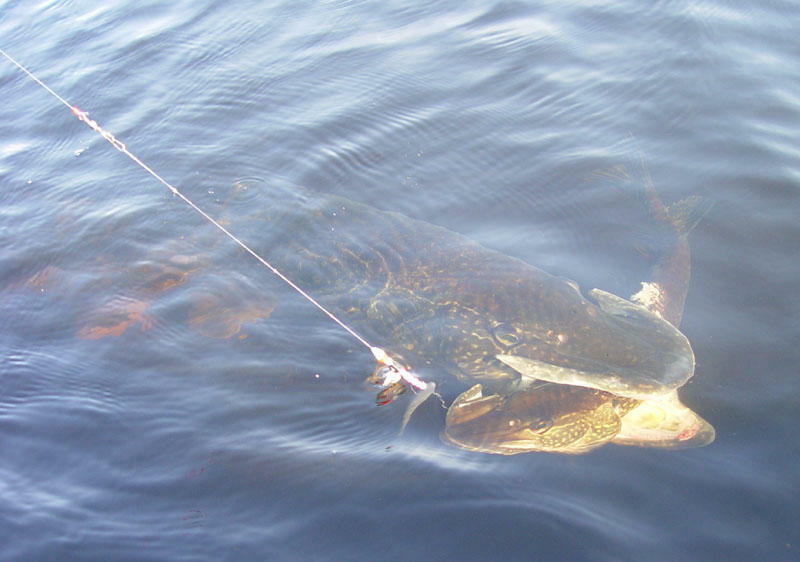 I understand muskies to not be real social fish, hanging around with all their muskie buddies. The Pike in the photo at the top of my home page, or maybe in my profile, I lose track. Geeezz, I MUST be getting old and senile! Anyway, that was a nice fish I caught on a "Green Meanie" which is not its real name, that's just what me and Ken call a certain green spinnerbait, on Lake Minnetonka when I used to fish with Sam (the "custodial engineer" at my old church). That one went about 10 pounds, but he fought like he was 15. I'm going to have to make a point of getting out on the water more often. Even when the fish are hard to find, what I used to call boredom has been somehow transformed into serenity, which I really dig. I appreciate it more the busier I get. So......... I guess I should be appreciating it more and more since I've gotten too busy to fish, but it's been a year. I got issues.